The Three Shorty Bears are colorful teddy bears created to showcase five colors of yarn in a mini pack or individually selected. German short row shaping creates round bellies, no-sew ears, pointed toes, curved arms, contrasting colored pads on the hands and feet, and a bottom so the bear can sit. 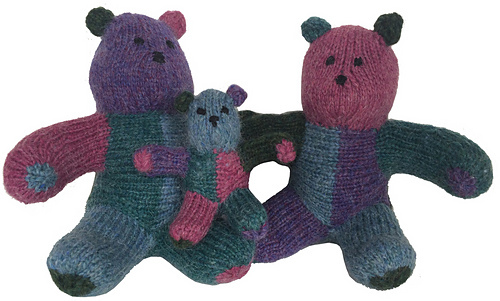 Shorty bears’ bodies are worked sideways and flat using four colors sequentially with no colorwork required. Back is left open and grafted closed at end. Arms, legs, bottom, and ears are added to body by picking up stitches. Working the appendages directly on the body is trickier, especially for Baby, but you are rewarded by no sewing later and a safer toy. The colors are rotated for each bear, both for appearance, and because the colors used for the head and bottom require a little more yardage.